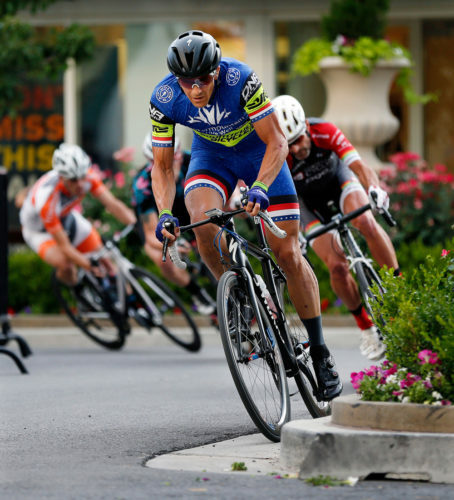 Station Park Crit in Farmington, Thursday, July 9, 2015. Photo by Ravell Call. “Given that I was an ‘at-risk' youth while growing up in Ogden, I attribute my involvement in cycling to helping me change my destiny. I was first introduced to cycling by my stepfather, affectionately nicknamed HAPS. After HAPS lost his battle with addiction in 2004, I felt a strong desire to give back to the cycling community in his honor, providing others the same opportunity to change their lives as I had been afforded,” explains Joel Rackham, founder and general manager of ThresholdSports. “Our vision is simple: We desire to influence and help others accomplish their goals of a healthy lifestyle through cycling and sports that are complimentary to it. We will always challenge ourselves and our teammates to be better; earning respect through our behavior on and off the bike, while adhering to the adage that you help yourself by helping others! I was introduced to Rackham's organization, ThresholdSports, after moving back to the Beehive State from California, where I run an elite bike racing program in one of the most competitive and prolific cycling regions in the country, the Northern California / Nevada Cycling Association. Our group has been supporting NorCal female and male racing squads for several years with the help of valued sponsors, so I understand how much work and sacrifice go into a successful bike racing program. And that's only one component of ThresholdSports's activities and mission. During the first part of 2013, I was racing for another Utah team when longtime friend and former teammate, Cameron Hoffman, found out I was leaving that squad. He immediately called me to recommend I become part of ThresholdSports's burgeoning elite program, raving about Rackham and great teammates of whom I was already fond, such as Manny Cypers, Clint Mortley and Darren Goff. 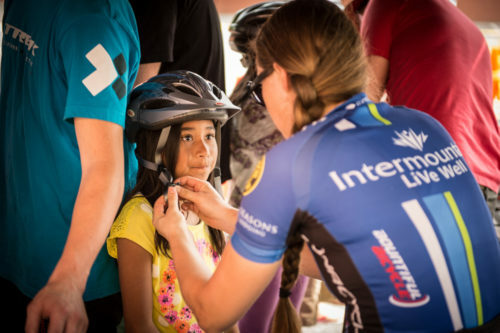 The organization's public, sponsored identity — Intermountain LiVe Well presented by Bountiful Bicycle — consisted of a somewhat scrappy bunch. They had huge potential, and enjoyed strong sponsor support for which they worked hard on and off the bike. What made this, my new team, and its leaders unique was their humility, desire to sacrifice and work for one another to get results, and willingness to learn. All of these qualities represented values that had proven both hard to find as well as challenging to instill in others throughout my career. Rackham and squad captain Cypers continually picked my brain, soliciting input and drawing on my experience as a rider, coach, and elite program manager. They IMPLEMENTED anything they weren't already doing; I immediately had immense respect for them. We raced extremely well as a squad and won numerous events, with all of the guys making great strides, destined to go on to bigger and better things each season, which they have done. I am no longer actively racing or coaching, and left the Threshold program about eighteen months ago. This provides me an opportunity to write relatively objectively about a club and its racing squads with which I had been acquainted before joining, worked closely while still actively racing as a member of its elite squad, and continued to follow after moving on to different recreational and career activities. ThresholdSports is Rackham's brainchild and passion-filled hobby (i.e. not his day job, which already keeps him quite busy, along with his family), which is only possible through significant contributions by several key board members: Austin Scott, Kaytie Scott, Justin Bingham, Darin Jensen, Clint Mortley, Jeff Jones, Darren Goff and Nate Tippets. 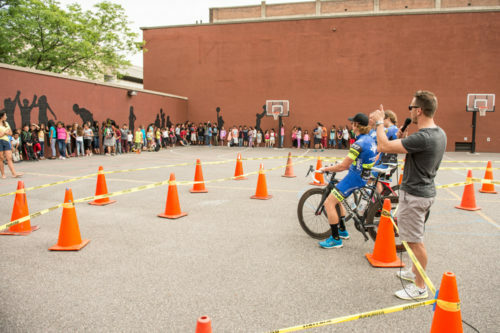 ThresholdSports is a DBA (doing business as) of ThresholdGives, a nonprofit 501c3 entity which, among other things, organizes several “bike safety rodeo” events where free bicycle safety education and helmets are provided to at-risk children and others in need. ThresholdSports was set up to run and operate the Intermountain LiVe Well p/b Bountiful Bicycle club and racing team, its USA Cycling elite squad, and its elite development team. The Threshold board and many others work hard to support what is now one of the largest cycling clubs in Utah along with its aforementioned three-tiered racing program, as well as organize numerous functions each year where over 1,500 free helmets are given away to those who may otherwise not be able to afford them. How can you not get excited about all that, even if you're part of a different team, club or other cycling organization? Austin Scott serves as president of ThresholdGives dba ThresholdSports, Inc. Like Rackham, he works tirelessly to promote the organization and support its riders, male and female, including (and especially) his accomplished racer wife, Kaytie, another Threshold board member. While I was still actively racing for them, Austin put in a lot of effort and hours on behalf of my fellow elite squad riders and me — as well as the entire club and its other squads. He is humble, service-oriented and friendly, as well as one of the most supportive spouses of an athlete I've ever known. Kaytie has always worked hard to advance women's cycling in Utah and beyond, all while focusing on her own racing and occupational careers. She is one of my favorite female athletes, both a fun, down-to-earth person and an extremely tough competitor. While still working full-time as a coach and bike fitter, I had the pleasure of ending Kaytie’s years of suffering on non-ergonomic bike saddles and in a biomechanically unoptimized cycling position. We've had a lot of mutual respect ever since. I found her a spot on Martin Santos's NorCal-based Halo Sports squad for Amgen Tour of California Women's Race last year, an elite women’s program for which she still races (https://m.facebook.com/zocacolnagoteam). ThresholdSports/Intermountain LiVe Well coordinates weekly group rides of various levels, which include designation of a ride leader for each group. These outings are welcoming to all, whether one is a veteran club member, a new teammate or a non-Threshold rider. The A groups provide spirited, race-pace rides for good training, while the C groups and less formal women’s groups provide lower key outings that include on-bike instruction for less experienced cyclists. Twice per month the club also hosts post-ride dinners at restaurant sponsors Sonora Grill and Thai Curry Kitchen, at no cost to club members. “Adding meals after the rides further serves to build camaraderie, as well as friendships between casual riders and racers alike,” offers Rackham. The Threshold organization promotes and supports all of these activities with the help of valued sponsors, its board and numerous club member volunteers. Rackham explains that this was all part of his dream of “giving back to cycling”. He has sought to surround himself with like-minded individuals who would share this vision and gain some of the same joy, family and friends togetherness, competitive opportunities, and health benefits that he has enjoyed through cycling over the years. I've always felt that Rackham gives back more than he's ever received, which is a blessing for the Utah cycling and racing communities, especially in the Ogden area, which previous to the establishment of the Threshold organization had represented a largely untapped cycling treasure. Ogden has become a major cycling destination, hosting the USA Cycling Masters National Road Championships for 2014 and 2015, as well as the USA Cycling Fat Bike National Championships in 2015 and 2016. As Rackham is quoted in the opening paragraphs of this article, one of his major motivations is the memory of, and gratitude for, his late stepdad nicknamed “HAPS,” memorialized on the club's jerseys. HAPS was a caring stepfather and enthusiastic cyclist with whom Rackham bonded on bike rides as a kid. Today, Rackham; his wife Melissa; co-founders Austin and Kaytie Scott, and Justin Bingham; and fellow board members Clint Mortley (a LOTOJA elite category winner and dominant Utah racer), Darin Jensen, Nate Tippets, Jeff Jones and reigning national champ Darren Goff revel in how far the organization has come over the years. The entire club membership has supported and watched its elite program develop into a top regional entity, boasting the reigning Masters National Criterium Champion, Goff (one of the nicest, most gracious bike racers you'll ever meet), as well as accomplished national level riders, some of whom have also raced internationally. Furthermore, riders like Branson Yantes have progressed within the program from beginner racers (Category 5) to elite participants (Category 1) at National Racing and National Criterium Calendar events. And while a club/team can always take pride in the prestige and opportunities its support of a successful elite squad affords, Rackham and his organization take great, equal satisfaction in the successes and advancement of all its members and athletes, across all cycling disciplines, including triathlon. ThresholdSports'sTeam Intermountain LiVe Well p/b Bountiful Bicycle does indeed help to provide Utah with better talent and geography equilibrium, extending the balance of power from the state's Salt Lake City epicenter further up the Wasatch Front into Davis and Weber counties. Other crucial programs also contribute, such as Roosters/Biker's Edge, Harristone/Sun Valley Mortgage, and Team Endurance360. Former pro Ryan Barrett, 3B Yoga owners Gabe and Amy Williams, Survivor celebrity and former Euro racer Tyson Apostol are four Utah cycling personalities who would like to see increased representation, acknowledgment and support in the cycling populations of Utah and Wasatch Counties. There is so much talent south of Draper and east of Provo, yet it seems largely self-contained, as well as largely self-sustaining, thanks to hardworking event organizers, generous sponsors, and other movers and shakers in that area. Let us hope that these geographies, along with others, further emerge to claim their rightful places alongside Utah's recognized cycling powers. For the moment, let's celebrate the Ogden area and its riders, who seemingly have never been as well represented at every level of cycling event participation and competition as they are now. This is thanks in large part to the efforts of Joel Rackham and his Threshold sisters and brothers (http://thresholdsports.org). Mark Deterline is a longtime elite women’s and men’s racing program owner/director (lulusleadout.com), and was a prominent endurance coach, performance tester and bike fitter in Utah and Northern California until last year. He has written articles and translated books for VeloNews/VeloPress, and was a longtime technical journalist for Triathlete and LAVA magazines. He is a marketing consultant, a translator for Globalization Group, and works with his daughter, a tattoo designer.